.. what census tracts are located in cities of interest? What are their codes? Conversely, do you have census tract codes and need to know corresponding city(s)? Get answers here. This section provides access to an interactive table useful to examine relationships among Census 2010 census tracts, cities/places, and counties. Many cities and counties that might be experiencing demographic-economic decline will often have bright spots that are groups of a few or many census tracts. Census tracts are important sub-county geography in data analytics. See the related section on census data analytics. See more about census tracts and data analytics below in this section. Census tracts are sub-county areas and nest coterminously within counties. The 6-character tract code is unique within county. For cities 10,000 and larger, there are some number of whole census tracts within the city. But around the perimeter of cities, census tracts will often be partly within and partly outside of the city. 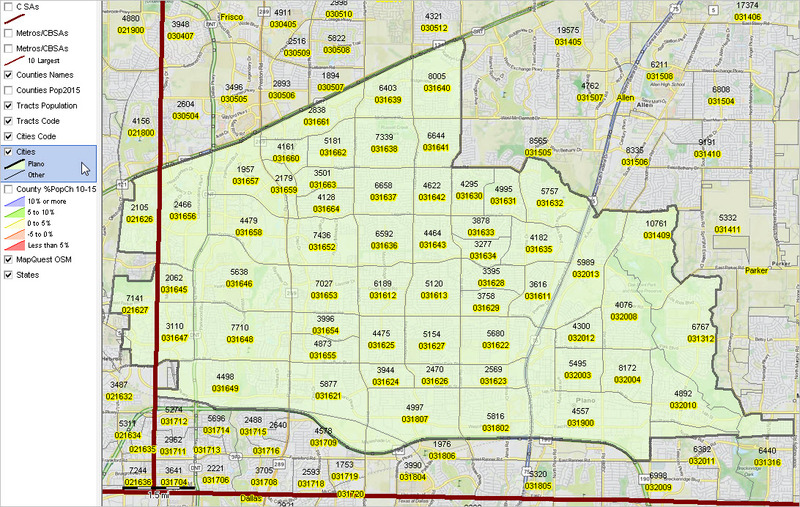 The following graphic shows the relationship of tracts, cities and counties in the Plano city area (green fill pattern) located mostly in Collin County within the Dallas metro. Click graphic for larger view, more detail and legend color/data intervals. This map illustrates the geographic level of detail available using census tract demographics and the relative ease to gain insights using geospatial data analytics tools. A small part of Plano is located in Denton county (see north-south bold red-brown boundary). 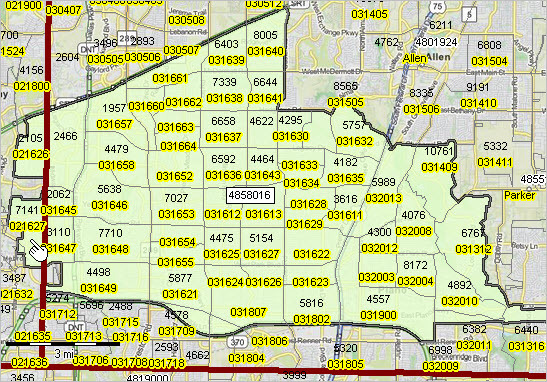 Tract 021627 (see pointer) is located in Denton County and includes a part of Plano. To determine what geography tract 021627 intersects, click the Tract> button below the interactive table shown below. See that the tract is contained in parts of 4 cities. The following graphic illustrates use of the interactive table to view/examine the relationship between census tract 48121021627 (in Denton County, TX) and the city of Plano, TX. Click graphic for larger view. – click the FindTract button (preset to locate this tract). Click the ShowAll button and enter a city/place (case-sensitive) name of interest to view the set of intersecting tracts. See the table usage notes below the table in the related Web page. We review operation of the table in the Data Analytics Web sessions. The world of visual and geospatial analysis continues to morph and evolve. So it is with R’s geospatial analysis evolvement. This section is focused on mapping statistical data with R and provides steps you can use to develop Web-based interactive maps in complete HTML structure ready to publish. No coding. R (more about R) is an open source language and environment for statistical computing and graphics. R has many similarities with the Statistical Analysis System (SAS), but is free … and widely used by an ever increasing user base. R is used throughout the ProximityOne Certificate in Data Analytics course. For now, in the areas of mapping and geospatial analysis, R is best used in a companion role with Geographic Information System (GIS) software like CV XE GIS. Maybe it will always be that way. R’s features to 1) perform wide-ranging statistical analysis operations and 2) to process and manage shapefiles and relate those and other data to many, many types of data structures are among R’s key strengths. The graphic shown below illustrates a Web-based interactive map that has been developed totally using R. The map shows patterns of Census 2010 population for Texas by county. Aside from satellite imagery, which can be added, this application provides the look and feel of a Google maps application. Yet the steps to develop the application are far different and much closer to more traditional GIS software and data structures .. and there are no proprietary constraints. Join us in weekly Data Analytics Lab sessions to learn about developing this type of mapping application and geospatial analysis. See more about this application in narrative below the map. … no coding .. see details in Web version of this post. Click graphic for larger view and details — opens new window with interactive map.. View developed using R.
R generates the final product HTML as shown above. This application illustrates use of a Census countyTIGER/Line shapefile integrated with Census 2010 demographics. Participants in the ProximityOne Data Analytics course learn how to develop the types of maps using a range of TIGER/Line shapefiles from census block to metro to congressional district to state and integrating subject matter from the American Community Survey and many other Federal statistical programs. R and the ProximityOne CV XE GIS tools work together to expand the range of analytics to an unlimited set of possibilities. Join me in a Data Analytics Lab session to discuss more details about using R for mapping, data management and statistical analysis in context of data analytics. Learn more about integrating these data with other geography, your data and use of data analytics that apply to your situation.